While being your own boss means having flexibility around your family, it doesn’t mean having less work than if you have a job - quite the opposite! There’s a lot to do and somehow you have to find a way to fit it all in. Anyone who thinks being an entrepreneur means swanning around having glamorous meetings and occasionally tapping something out on their laptop needs a reality check! Many Mumpreneurs struggle with time management, simply because they have so much life and work to cram into each day. To keep your business running you need to become an expert at keeping all the balls in the air. Says Carli Wall from Synergy Business Support “Choose a to-do list method that suits you. A notebook, a whiteboard, or an app on your phone are all fine as long as you use it and update it throughout the day. Start the day creating or reviewing your list, so you can hit the ground running with what needs to be done that day. Be realistic about how many tasks you can get done in that day and don’t forget to carry over anything couldn’t get around to”. Prioritise your workload to ensure the most important things get done, even if the others don’t. Work through your to-do list and prioritise each task depending on whether it is important (will it directly bring in money for your business or drive your business forward towards an identified goal?) and if it is urgent (does it need to be done today?). Business coach Jo James recommends the MIT technique. “First decide what’s the #1 Most Important Thing (or MIT) you need to do right now to help you move towards your dream or goal. By completing your MIT earlier in your day, it will send a good positive feedback loop to your brain, giving you more energy and drive to tackle the next MIT”. Rather than reacting and responding to emails when you sit down at your desk, or getting drawn into something that drains your energy by 9.30am, do your #1 MIT first. “Notice the difference in your mood and your ability to get more done in the mornings,” says Jo. Schedule your day as if you worked in an office. Start work at the same time every day - perhaps before everyone gets up, or after the morning school run - and have a set time for social media, for meetings and calls, for responding to emails, for the main bulk of your client work, for admin etc. The most important thing is not to get distracted by things that don’t need your immediate attention. Says Carli “If you have a list of things to do that are urgent but not important, beware of spending too much time on them. They most likely involve responding to interruptions, for example answering an email or returning a call. Their timescales make them urgent but is it vital that you spend your precious time on them right now? 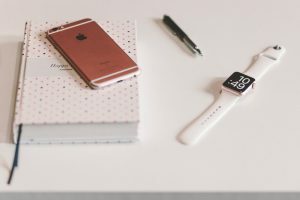 There’s a danger of frustration from feeling like you’ve been busy but not actually getting anything productive done if you spend too much time on these items”. Sound familiar? This is why keeping and reviewing your to-do list throughout the day is key - and always focusing on your MIT first and foremost.